Another colder and damper day. Grand Central Station, lobbies of the Chrysler Building and the Empire State and general midtown wandering were done, subway trains were taken, bagels and a fabulous lunch were eaten, coffee and champagne drunk. Tomorrow, similar, I should think, with a different section of the midtown to start. Happy. I still haven't bought a book, although I've held Michael Cunningham's 2002 book about Provincetown, and Anne Tyler's paperback Digging to America and many, many notebooks in my hands and thought about it. Then wiped the slaver off them and put them back. So strong-minded, no? Well, I've bought one notebook, I confess. I thought that would cure me, but of course, there are always more notebooks begging to be bought. Besides the decorative ones, they have these hardcover Composition Books here; I got a rather flash one of those, but I saw another kind today, that was much fatter and sturdier and humdrum-looking. It cost all of $1.98. I thought of my suitcase, and the weight of all the books I intend to find at World Fantasy, and virtuously replaced it on the shelf. We were thrown out of our dinner restaurant Tuesday night by a party containing John Cusack (whom I did not see with my own eyes, but others swear he was there) and Peter Riegert (star of Local Hero and Crossing Delancey, whom I did see). The maitre d' was actually hostilely muttering in our direction about people who'd promised to be finished by nine but were still hanging around not-being-A-listers at nine-thirty. Snicker. What a town. Today it rained, instead of being hot and muggy; everyone we met apologised for this, although it's much better weather for tourists in a lot of ways. Steven did all his electronics-shopping (well, maybe not all - sigh!) and I went in to Knopf and met the team there, then went to lunch with 'my' editors. Then we came home and tended to our jetlag a little, before going out to dinner at a Turkish restaurant and for a walk towards the East River as a roundabout way home. Halloween decorations everywhere. Squash and pumpkins piled up in lobbies and shop windows, skeletons strung from ceilings...they're really serious about this holiday here. Question: Why are none of these doormen writing novels? It's the perfect job for that! But no, they're just sitting next to the pumpkin displays, watching the world go by and wishing they were somewhere else. Maybe they wait until the early hours of the morning, when there is less world going by. I hate to think of all that wasted writing time. Hoot! Look, here is proof that I was there at Borders, too. Yes, that's my elbow, that's my arm, that's my name label. Renee from Bacio, if you're watching, that's the top you sold me! And here is the list of Clarion South tutors for 2009: Sean Williams, Marianne de Pierres, me, Jack Dann, Kelly Link and Gavin Grant. Gorn, you know you want to. How can you resist that line-up? Here I am in New York, in an apartment on the Upper East Site that reminds us of nothing more than our own saggy, down-at-heel house back in Lewisham, only with more traffic noise echoing down from 2nd Avenue and taller neighbouring buildings. It's our second full day in New York - a rest day after yesterday's fol-de-rol. Brunch with the Click authors was wonderful - there we are in the photo, full of brunch. (Click on it to be dazzled by my teeth. Tim Wynne-Jones is there, too, hiding behind Linda Sue's head.) And then the event itself, at Borders, went really well. There were paparazzi, even, because of Colin Farrell, and that was an experience in itself - my retinas have never been peppered with the after-images of so many flashes going off. The photographers were piled up at the back of a large crowd of more normal people, not all of whom were there to ogle Colin, and he gave very gracious speech for Amnesty and then handed over to Arthur Levine, who introduced us one by one, when we talked a tiny bit about what we'd done and read a couple of pages from our chapters of Click. Then he asked us a few curly questions, and allowed the audience to ask us one or two, and then we signed, signed, signed - it was amazing and delightful how many copies of the book we signed. Then Steven and I Walked in New York; we'd been through the bottom half of Central Park on the way to the event, and we continued on down Broadway until Broadway got too crowded - and it was hot! - and down 7th Avenue. We finished in Washington Square, which was all squirrels and musicians, and rested our sore feet for a while, then went on to Lupa, a Roman restaurant, where we had a fan-bloody-tastic dinner and way too much wine and laughter with Linda Sue and Tim. On to drinks with some children's literature professionals and then we rolled home across the Park, in the near-dark, and weren't attacked once - not even by squirrels, and we knew there were a lot of them around. And now we're going to try out the subway and head out to dinner again. It's even more summery here than at home, except for a few trees beginning to change colour. And New York is full of wonders. over here. Rob Hood made it do it. Garth Nix will be the next to feel those sticky suckers. For those of you thinking 'WTF? ': Squidsquatch. A new interview (almost) every day. A single question. The subject one day becomes interviewer the next. Come and talk to me at this event, because I'll be sitting there clicking my pen while the other three authors are bravely toiling through their queues of fans. The anthologies are coming thick and fast. Yesterday I got my copies of Bill Congreve and Michelle Marquardt's Year's Best Australian Science Fiction & Fantasy 3 from MirrorDanse, with 'Hero Vale' from Red Spikes in it. And today, Ellen Datlow, Kelly Link and Gavin Grant's Year's Best Fantasy and Horror #20 arrived, with 'A Pig's Whisper' from Agog! 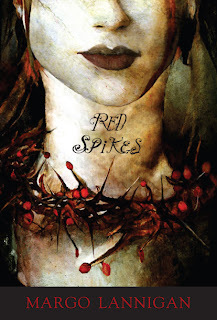 Ripping Reads and 'Winkie' from Red Spikes. Also, a proof copy of Jonathan Strahan's The Starry Rift: Tales of New Tomorrows: An original science fiction anthology, in which 'An Honest Day's Work' appears. Three big boxes of chocolates. Where does a reader start? Okay, Monday, October 22nd, is Click day. At noon at the Columbus Circle Border's store in New York, there will be a conversation between the authors Roddy Doyle, Linda Sue Park, Tim Wynne-Jones, Deborah Ellis, me, and possibly Eoin Colfer and David Almond), moderated by publisher Arthur Levine, and then a book signing. Colin Farrell will also be there. Also possibly other Amnesty-Associated celebs, as well as school groups. Sounds wild. 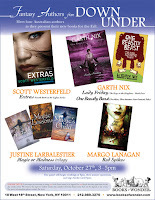 The following Saturday, 27 October, there is going to be a signing by Australian speculative fiction authors, 3–5 pm at Books of Wonder. There's an Archetype in My Soup! Much fantasy deliberately employs elements of fairy-tale and myth, often after much scholarly research. But there's still the old argument that if you have to learn an archetype, it isn't one, that these patterns are universal in human storytelling. What is the mythic "buzz" we all know when we see it, even when we have difficulty defining it? 'People always ask why a majority of my work centers on birth, love and death. I guess the answer would be it helps me understand the impermanence of life on this planet. 'I have always felt that by bringing ego and materialism into perspective we will find wisdom lying within those willing to listen. Our gift for generations to come can be realized through the seed of hope we plant in our children. Apparently, 'A Fine Magic' (Eidolon I) and 'A Good Heart' (Red Spikes) made Gardner Dozois' Year's Best's Honourable Mentions list. Gwenda Bond says Click is not the train wreck you might expect of a novel with 10 authors, and people have been asking about it at the Little Shop of Stories in Atlanta. Paul Burman says Red Spikes is 'seriously weird in the best kind of way' and great holiday reading, for anyone who might be heading off on a holiday soon. Gavin Grant is also nice about it, saying '... this slim collection will be a prized possession long after other epic fantasies have been forgotten'. And Colleen Mondor reckons it's 'good for a shiver or two and should impress and delight equally'. What's more, New Yorkers will be able to get signed copies in a week or so - eep! Lanagan, whose Black Juice won critical acclaim both in her native Australia and in the U.S., will further enhance her reputation with this fine second collection of 10 stories. Driven by beautiful, often quirky language and deep psychological insight, these works demonstrate a powerful sense of the marvelous. In “Baby Jane,” a boy on holiday hears a magical servant shout, “My queen is in difficulties. Is there a midwife here?... Any kind of leech, any wise woman,” and finds himself in charge of delivering a royal child; a different sort of child, an emotionally needy girl who fears she will “die of her distress” after being separated from her mother for a night, must show some gumption and outwit the terrifying, baby-eating ogre Wee Willie Winkie in “Winkie.” Other memorable characters include the dead souls in Limbo, who in “Under Hell, Over Heaven” earn brownie points by transporting the recently deceased to their final reward or punishment; and the eponymous “Daughter of the Clay,” an unhappy changeling who travels to fairyland and decides in the end that it's best for her “to stay silent, on my bottom among the Clay, and fill my mouth with fish.” Gritty, dark and sometimes very nasty, these stories are, at their best, worthy of comparison to the fairy tales of Angela Carter. In other news, revisions are going well but not fast enough—that is, they should be finished, and they're not. All attendant stress disorders present and correct. Also, bushfire season has started in fine style. Our baby Harry is disporting himself in the cobbled streets of Luang Prabang (Laos). Today I start three weeks' work at a bank in the city. Good day to you.